Step aside tea and cake, Revolution bars across the UK are offering you Britain's tastiest tradition with a boozy twist. 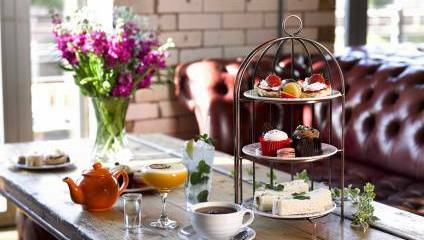 A bar famous for it's bubblegum flavoured shots isn't going to offer you a bog standard high-tea, and this tea for two offers a delicious array of traditional treats with the occaisonal cheeky booze infusion. Sandwiches like coronation chicken and prawn Bloody Mary on rye sit alongside fruit scones with the usual trimmings, and melt-in-the-mouth sweet treats like Poppin’ Chocolate Brownie and Woo Woo Jelly are yours for the taking. The clincher? Forget the brew and enjoy a cocktail of your choice from the extensive drinks menu. This offer is available at 50 Revolution bars across the UK, including bars in Manchester, Brighton and Bristol. 6. This competition is 18+.